If slaying mass amounts of blood-thirsty zombies in a post-apocalyptic world is your thing, look no further than Alive 4-Ever. This top-down shooter from Meridian takes the crown as king of the zombie survival genre by mixing in RPG elements, outstanding graphics, and loads of gore. 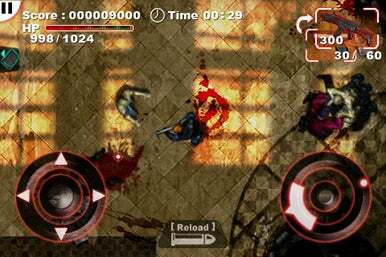 Fire Away: The controls in Alive 4-Ever—a virtual joystick for walking and another for aiming and shooting—have a smooth feel to them, adding to the quality of this zombie-blasting game. Alive 4-Ever’s back story is one we’ve all heard before—a pharmaceutical company’s new drug has the unfortunate side effect of turning people into zombies resulting in hordes of the undead outnumbering the living. As you might expect, it’s up to you and a few others to rectify the situation by any means necessary. So it’s time for a little zombie rehab—one bullet at a time. The mechanics of the game are essentially the same as others of this genre. Alive 4-Ever gives you a top-down view and two virtual joysticks—one for walking and one for aiming and shooting. The controls have a very smooth feel to them and work quite well. Scattered around the levels are useful items like heath packs and ammo that can be picked up by tapping an icon that appears when you get close to them. There’s also a reload button and a weapon icon you can tap to cycle through your different guns. Alive 4 Ever has 30 levels and even a few bosses to defeat. To keep things interesting, you have to contend with all sorts of different zombies—from the slow, lumbering type to fast-moving undead dogs. Each level has a main mission such as killing a certain number of zombies or rescuing survivors, as well as side missions like completing the task in a set amount of time for extra experience. As you complete levels, you gain experience and cash. Gaining experience and leveling up gives you the ability to add points to your attributes like maximum hit points and critical hit rate. The cash you earn can be spent on better weapons and items. The RPG side of this game really takes it to the next level of addicting gameplay. The graphics in Alive 4 Ever are outstanding with detailed environments, great lighting and shadows, and really cool-looking characters. The blasting of zombie scum is made even more enjoyable with large amounts of blood spraying everywhere, as you riddle your enemies with bullets. Adding to the dark atmosphere of the different levels is a haunting musical score that sets the perfect tone. Aside from the music, the in-game sound effects of moaning zombies and rattling machine gun fire are nicely done. Everything about this game comes off as highly polished, right down to the menus. Previous leaders of the genre like iDracula and Minigore were fairly decent games that—to me, anyway—ultimately felt like incomplete projects or fragments of a game. Alive 4-Ever stands out from these offerings as a more complete game by adding in different levels, numerous weapons and items, level bosses, and RPG elements that keep you coming back to the game over and over.